Free camping at the Pancho Villa Museum in Durango, Mexico in March. The museum was free to but we gave a 100 peso donation. A deal all around! November 28, 2018 – March 10, 2019. 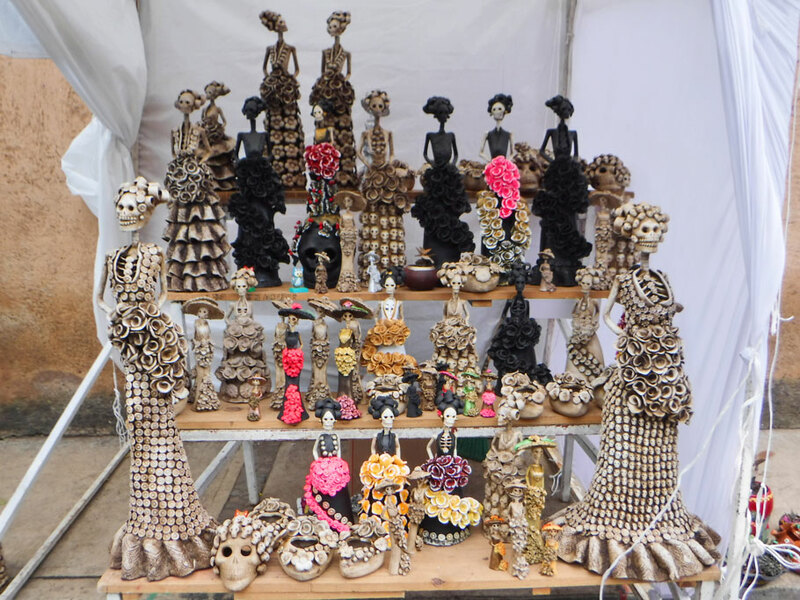 Ok – I was going to do a regular expenses blog for the months of February and March but then I started thinking about how much money we spent all the months of our Mexican journey. Although we are spending mostly pesos while we are in Mexico, I have converted all expenses here into US dollars. Because the exchange rate is different every time I get cash from an ATM- it is a bit of a process to convert. Luckily, I like numbers and being accurate. Click here to download the actual spreadsheet. Before we get to looking at final analysis of the trip, I want to just look at February since we have already reviewed January, December and November’s numbers in previous posts (click each month to see those numbers) and will be reviewing the 10 days we spent in Mexico in March in the March/April report. This is for 17 gallons of water. 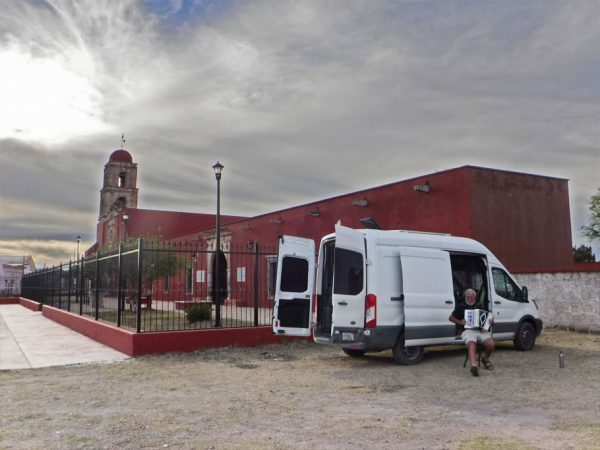 We put a few miles on Ballena Blanca in February – but probably not as many as we would have if we hadn’t spent 9 days in Guanajuato sick with colds. This is our regular US car insurance payment. See notes below about our Mexican car insurance. We hardly ever pay for camping in the US but there isn’t the same kind of free public land to camp on in Mexico. I knew we would be paying a lot more but I was really hoping to average $10 a day or less – and we did it! If you are interested in where and what types of places we camped check out our monthly numbers posts for November, December, and January/February/March. 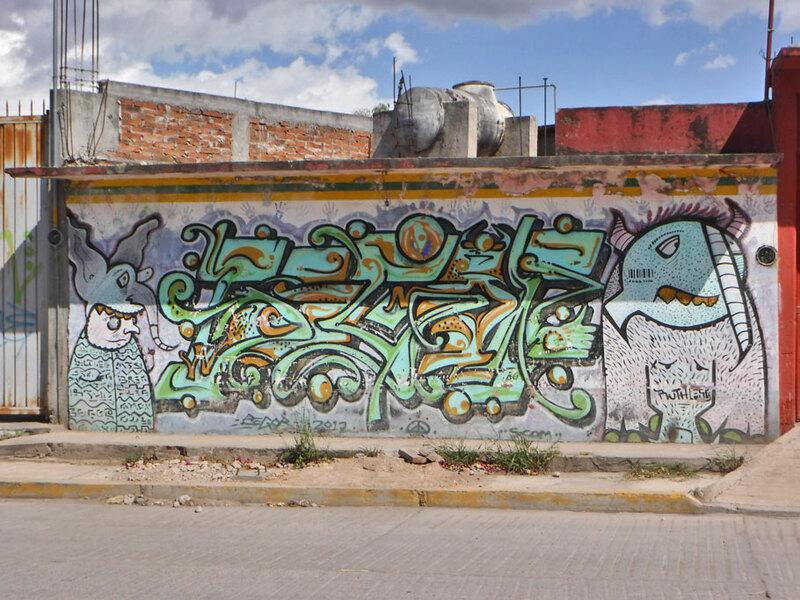 I love street art like this mural we saw in Oaxaca in January. Always free! Our food bill for the month was about 15% cheaper than it usually in the US and the booze bill was about half as much. The cheapest beer we found was Carta Blanca which usually sold for 51 pesos for a six-pack. We liked the taste of it and when you convert those pesos into dollars a six pack was costing us on average $2.65 – super cheap! Eating out and museums in Mexico is so extremely inexpensive. February’s number includes eating/drinking out 11 times and visiting or touring 13 different museums or sites. Ugh! – a little over-the-counter cold medicine. The biggest expense here, $84.81, is our phone plan with Google Fi. We could probably find a cheaper plan but I have been so happy with Google Fi in Mexico. We have up to 15 gigs of data and international phone calls are inexpensive. The rest of our February expenses were for gifts for family and friends and a new musical instrument for Greg! Gift shopping for a Katrina in December was quite fun! 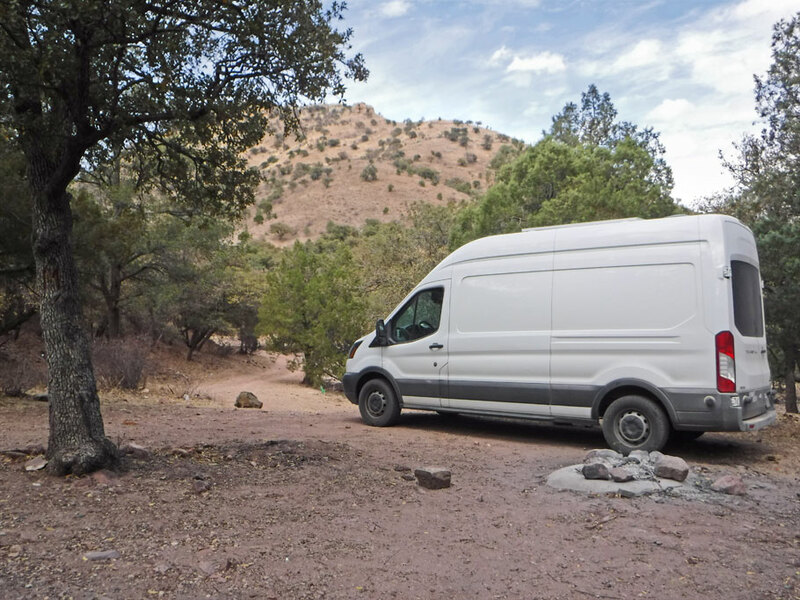 This includes all of our non-normal travel expenses outside of our usual van travel expenses. Our number from February also includes all of the tolls we paid in Mexico – there are a lot of tolls. For the most part, we avoided the toll roads which usually took us through small towns and often down rough roads. This, of course, added to the adventure but sometimes we just wanted to get somewhere fast like when we ditched our plans to go to the Lava Church and headed to Guanajuato instead. That 200-mile trip cost us $24.49 in tolls. Besides tolls, February’s expense number also includes $4.05 for bus fares. A tour guide in Guadalajara told us that “No Manches!” means “Oh My God! in English. I added this category for unexpected expenses like getting our computer repaired. So pleased that there were no No Manches expenses for the month of February! Our campsite in the Cumbres de Maljalca National Park ended up being free because because there was no one there to collect fees. Total money spent: $7,023.33 for 102 days in Mexico. Since I knew that some things like gas and camping were going to cost us a lot more than they do in the US, I set for myself a few mental limits/goals before we crossed the border south. I didn’t want to spend more than $300 per month on camping and didn’t want to spend over $2000 per month in total. We did good on the camping – averaging $6.97 per day or $209.21 based on a 30 day month. 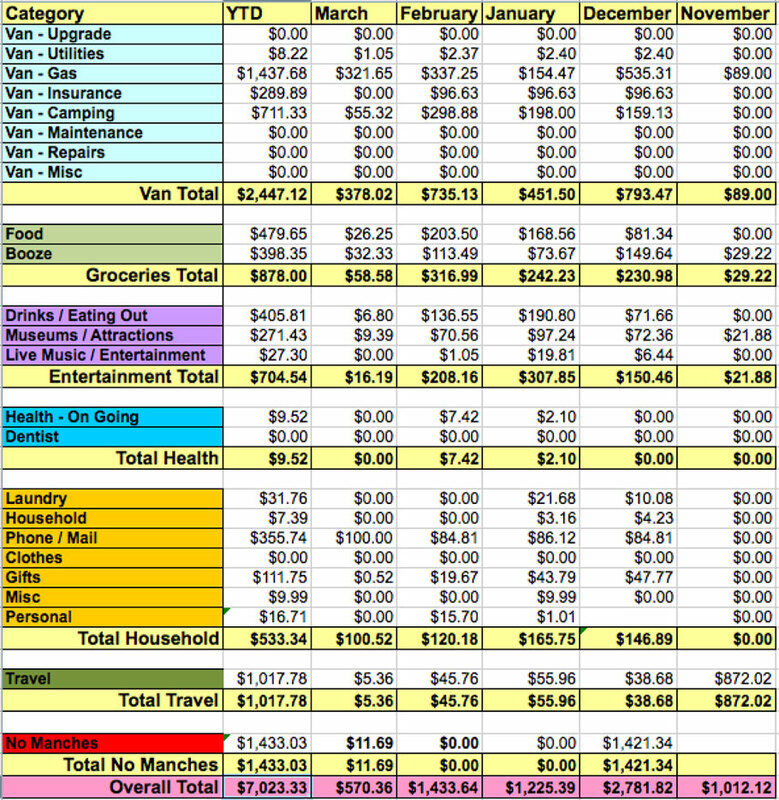 Including all of our expenses, we spent about $68.86 per day or $2065.69 per month based on a 30 day month – just a tad bit over my goal. 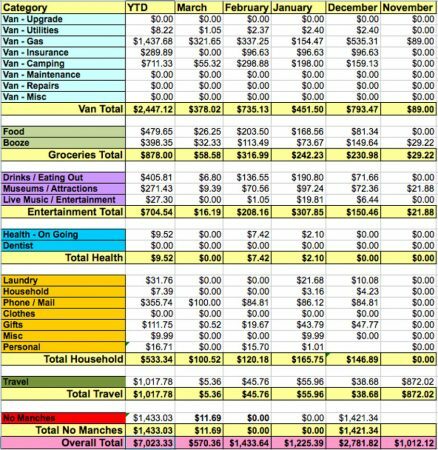 But if you take out the No Manches expenses from December when my computer broke ($1397.57) our 102 days roaming around cost us about $55.15 a day or $1654.64 per month! * To travel to Mexico we needed to buy Mexican car insurance. We could have dropped our American car insurance for those months but we choose to keep it despite the extra expense for fear of potential problems with our insurance company by having a gap in our coverage. * We show a No Manches expense for March. We mainly used cash for all of our purchases in Mexico and I kept track of every cent we withdrew from the ATMs and every cent we spent – which was often times anywhere to 3 to 6 cash purchases every day. But when I entered everything into my final spreadsheet I found that the actual money we had left over didn’t match the money we spent. I found about 500 pesos of it where I had neglected to record a couple of days of camping expenses but I never found the last missing 225 pesos – oh well, I know it was spent so it went into the No Manches column. * When we entered Mexico we had to pay a deposit for our TIP (Temporary Vehicle Import Permit). This deposit was refundable when we exited Mexico. Because I used my credit card to pay for the deposit and the exchange rate was high (20.15 pesos to the dollar) when my card was charged and lower (19.42 pesos to the dollar) when the money was refunded to my card, we made $15.22 – bonus! * For those who have not read or don’t remember our November expense report – the expenses in the Travel column were for the cost of our half of our Airbnb in Mexico City ($280.27) and the cost of our Mexican car insurance ($483.59) The rest is for the cost of copies of all of our important documents and entry fees into the country. So what do you think? 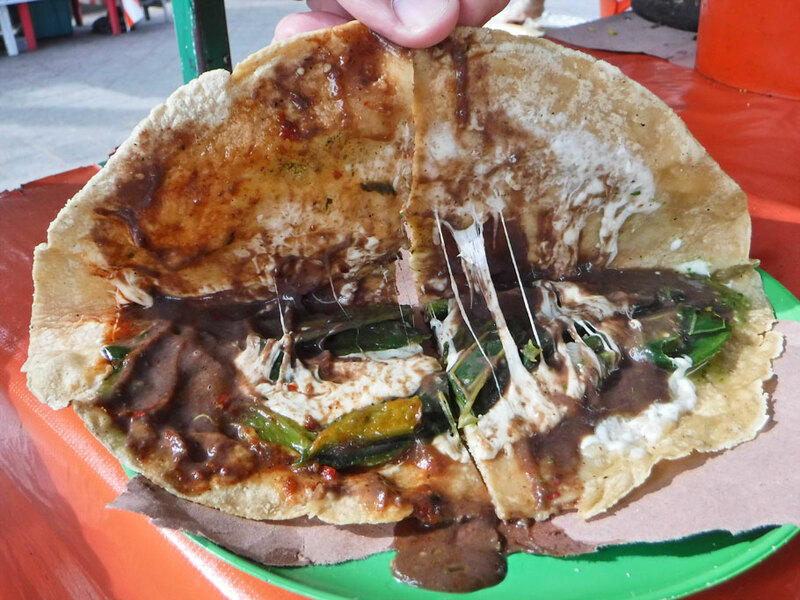 Are our expenses in Mexico less or more than you would have expected? Are you ready for a Mexican vacation? This entry was posted in Cost of Nomading, Mexico, Nomading, Travel On The Dirt. Bookmark the permalink. Interesting! Safe travels to your next destination! Thanks Brenda! Visited a “glass beach” in California yesterday – thought of you, of course! You guys did pretty well! No Manches anymore. 🙂 It seems like the price of camping was made up by the cheaper booze and groceries. Pretty similar to three and a half months in the US all together, I think. And, when you leave the computer expense out, you’re right on track. I liked how you broke down some of the numbers on a daily base. Very interesting! Stop. You had me at $1.32 quesadillas. I know! And they were huge!